I picked up the 1996 Untold Tales of Spider-Man annual a little while ago - there was a Spidey/Fantastic Four crossover I wanted to grab. 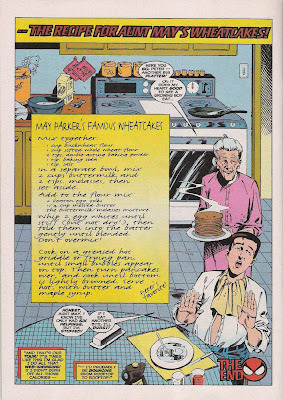 This particular issue had a number of secondary features, but the one that stood out most to me was on the last page, which displayed the recipe to Aunt May's "famous" wheatcakes. 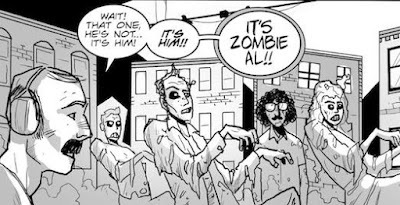 I've scanned a copy and have uploaded it here if for no other reason than I have NO IDEA why Stan Lee felt it prudent to incorporate this little bit into the Spider-Man mythos. Wheatcakes? Really? Now that I see the recipe laid out for me, I'm even more perplexed. It seems like they'd be disgusting. Is this what people ate in the 1950s and '60s? Did it help us defeat communism? Seriously, wheatcakes. I don't ever want to try them. In a separate bowl, mix 2 cups buttermilk and 2 teaspoons molasses, then set aside. Whip 2 egg whites until stiff (but not dry! ), then fold them into the batter gently until blended. Don't overmix! Cook on a greased hot griddle or frying pan, until small bubbles appear on top. Then turn pancakes over, and cook until bottom is lightly browned. Serve hot, with butter and maple syrup. I'd be really interested in seeing if anyone could possibly eat these, and what their opinion might be, or if this might be just a really long-running comic book joke. Have you never made pancakes from scratch before? Those recipes are very similar to this--just with more refined, softer flour and no molasses. Sorry not meant to be insulting, just pointing out that the recipe might sound odd to you if you don't cook, but it's not disgusting and is quite common. I dunno. Molasses, the few times I've used it, seems to be pretty undesirable. 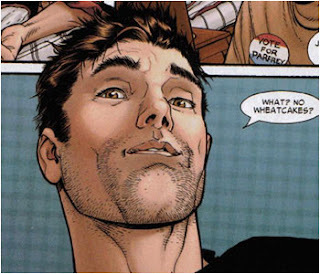 And perhaps it's my unrefined tastes, but I've never been a fan of wheatcakes in general. I have made these a few times are they taste great. Aunt May makes them so they have to be good. I read that comment with an Italian accent. An unbelievable amount of MORE random updates! Another signing at New Dimension Comics! Guess who's going to the Pittsburgh Comicon?